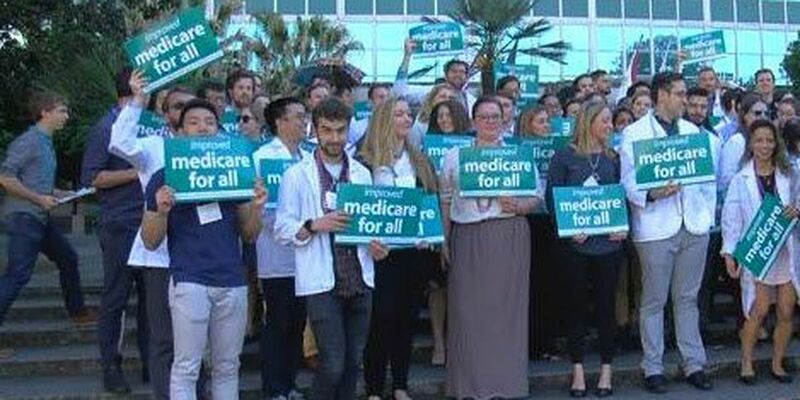 NEW ORLEANS (WVUE) - Medical students from across the country gathered in New Orleans, Saturday, walking the streets chanting, advocating for a single-payer system. It's the seventh annual march for the group-- Students for a National Health Program. A sea of white flowed towards City Hall, demanding healthcare for everyone. "We're here under the idea people deserve equal access to healthcare. People are going bankrupt, people are dying because they don't have access to the basic medical care needs they have," said medical student Kale Flory from Missouri. More than 100 medical students from across the country marched in New Orleans, vying for a single payer healthcare system. "It would mean for everybody who lives in the United States, they would have comprehensive healthcare for all of their basic needs," Chicago medical student Cyrus Alavi said. Students say legislation in Congress is gaining momentum, but lacks bipartisan support. "It'd be great if we could get our politicians to unite on this thought and get everyone to cosponsor these bills that are currently in legislative sessions," Flory explained. These med students say, with the way things are now, some of their future patients won't be able to get the care they need. "I kind of treat all my patients the way I would my family members and having someone come to you and having no power to help them is something that hurts and once you feel that, there's no going back," Chicago medical student Maria Mihailescu said. "We're getting a wonderful set of knowledge and skills and we'll be able to take care of patients but we don't want insurance to get in the way," said Louisiana medical student Justin McKone. "We have jobs no matter what. We're going to get paid, essentially, the same amount either way. This is about our patients." Those against single payer systems argue universal healthcare does not necessarily mean everyone has the same access to care. They say countries with universal coverage often ration care and require long wait lists for treatment. Louisiana Senator Bill Cassidy has long been opposed to the idea and even co-sponsored a bill to dismantle the Affordable Care Act.